She'll treasure these delightful diamond rose stud earrings from the Enchanted Disney Fine Jewelry collection inspired by Belle. Fashioned in shining sterling silver, each bold sculpted design features a blooming rose with a single sparkling diamond at its centre. These earrings secure comfortably with friction backs. Enchanted Disney Fine Jewelry Diamond Belle Earrings is rated 4.5 out of 5 by 2. Rated 4 out of 5 by Anonymous from Overpriced I was slightly disappointed with these. They are very pretty but smaller than I expected. Arrived in a big presentation box which only highlighted their small size even more. Although they have a diamond in I personally feel they are a bit overpriced as they are only silver. I do like them, but not as much as the other pieces of jewellery which I have from this range. Rated 5 out of 5 by Anonymous from Belle's beautiful rose earrings. 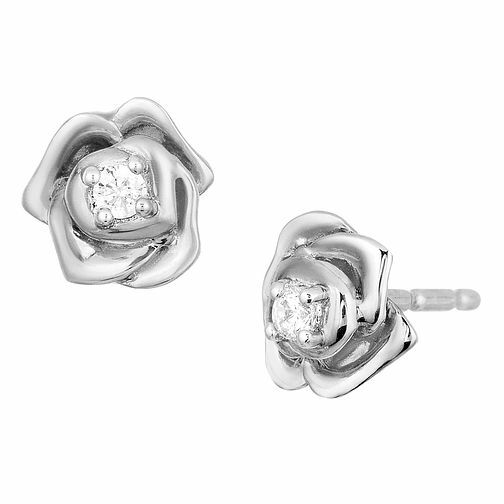 I love them, beautifully crafted rose earrings with a diamond centre.